"The famous Royal Enfield makes its debut under its OWN NAME, shedding its American identity of feathers and war paint." The allusion is to the Indian motorcycle company which, near the end of its string, imported Royal Enfields from England and sold them, rebadged and lightly modified as Indians in the United States. This went on from 1955 to 1959. 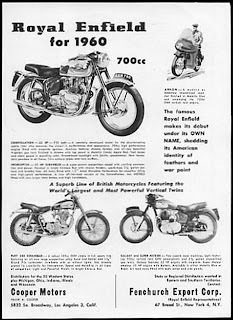 Royal Enfield went out on its own in 1960, with some glee and enthusiasm, judging by this ad. Perhaps deliberately, the "Superb Line of British Motorcycles" is illustrated with English pedestrian slicer license plates, of no use in the United States. English motorcycles would enjoy a wave of popularity in the United States and Royal Enfield would try to ride along. Indian would languish without them. The Indian connection has left a legacy of confusion, what with Royal Enfields being built in India since 1955 and now imported into the U.S. -- but as Royal Enfields, of course, not as "Indians." This ad gives a feel for the spirit with which Royal Enfield attacked the American market in the '60s.